The Narrows Bridge is a freeway and railway crossing of the Swan River in Perth, Western Australia. ... The original road bridge was opened in 1959 and was the largest precast prestressed concretebridge in the world. 1697 - Sighting by Dutchman, Willem de Vlaming. ‘Swaene-Revier’ was named. 1801 - French ships ‘Naturaliste’ and ‘Geographe’ visited; an expedition led by Captain Françios Heirrisson examined the Rivière des Cygnes as far as the mud flats now Heirrisson Island. 1827 - First British exploration of the area to prevent the French from colonising the western side of the continent. Melville Water, Point Belches and Canning River named. 1829 - South Perth peninsula reserved for suburban expansion of Perth. 1831 - Settlement slow. Foreshore areas facing Perth Water, Melville Water and Canning River divided amongst only 7 people. 1833 - First land grant: William Shenton who built a mill at Mill Point and became the first permanent resident. 1834 - First suburban lots offered for sale by the Government. 1892 - South Perth Roads Board District formed by excision from City of Perth, bounded by Melville Water, Perth Water, the Perth-Albany road, the Perth - Fremantle road, and South Terrace. 1892 - First meeting of the South Perth Road Board. 1898 - South Perth Roads Board extended to Canning Bridge. 1917 - South Perth residents voted against Greater Perth Scheme. 1902 - South Perth became a Municipality. 1904 - Laying of the foundation of the Municipal Office corner Mends Street and Mill Point Road. 1905 - Municipality divided into three wards. 1922 - South Perth became a Road District. 1955 - Manning, Salter Point, Mount Henry and Waterford annexed to South Perth from the Canning Road Board. 1956 - South Perth became a Municipality. 1959 - South Perth declared a City. The current municipal offices were opened in 1960, coinciding with the opening of the Narrows Bridge directly linking South Perth with the CBD. The foyer of the Civic Centre offices included a linoleum-cut mural depicting the history of the area to date. Rivers were at this time seen as the ideal means of transporting goods and were increasingly engineered by dredging, to accommodate larger loads. The Swan River was remade for transportation purposes by removing sandbars, filling and dredging channels. The first change made to the natural environment after European settlement was in 1831 when a canal was cut making Burswood into an island. (Camfield Henry, Correspondence and legal documents 1829-1865, Acc 1459A). "duble stake and a wattled fence filled in with clay, three feet above low water and three feet high." When the first canal was relatively unsuccessful, a second canal was cut in 1834. In addition the River was straightened in an effort to correct what were seen as nature’s shortcomings. The arguments used to dredge and straighten the river were utilitarian and health based. The Narrows bridge idea is "ridiculous"
By the time the Black Swan was launched in October 1869 the community had persuaded authorities that they needed a recreation ground. The dredge, unsuited to dredging in shallow waters began work on channel deepening in the river but by 1870 it lay idle and rusting at the Government jetty. The costly investment appeared to face technical and political barriers to its use and was described as "the steam dredge affair." 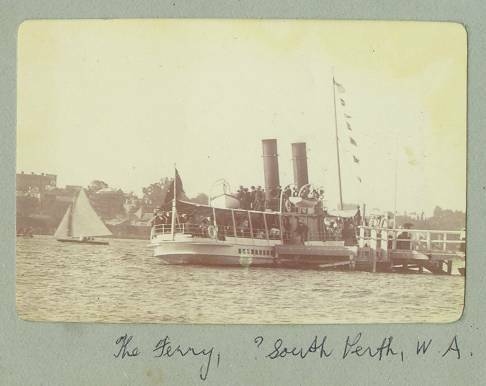 A ferry service from Perth established in the 1880s made the area much more accessible and in 1898 two major attractions opened — the Perth Zoo and the Windsor Hotel. Swan Keeper tending swan adjacent now-defunct Millers Pool, near the Old Mill, South Perth, c1900. Perth can be seen in the background. It is less than a kilometre from Perth's city centre, but its relative isolation on the opposite side of the Swan River has shaped how South Perth has developed over the years. In the early days of the colony, there was no easy way of crossing the river so few people chose to settle there. "The history of South Perth, industrially, dates back to 1833 when the well-known windmill was built just near where The Narrows Bridge is now,"
The low-lying land on the peninsula was flood prone and attracted only Chinese market gardeners and dairy farmers. From the mid 1930s the reclamation work to "improve and beautify" South Perth got underway in a stop start fashion as the dredge was constantly needed elsewhere. A retaining wall was slowly built from Mill Point along Melville Water and a riverside road developed. Discussions began on reclaiming from the Mends Street jetty east towards Millers Pool. Those protesting against the reclamation of Millers Pool led by architect and Perth City Councillor Harold Boas, stressed the historical significance and beauty of this natural feature of the river front as well as the aesthetics and the need to retain the panorama from Kings Park. Those in support the reclamation complained about the mosquitoes harbored in the area and the costs, including the health costs, of keeping the Pool. In 1938 it was announced that the reclamation between Mill Point and Mends Street Jetty including all the low lying market garden areas between the Causeway and Mends Street Jetty would proceed. The passionate debate for and against the preservation of Millers Pool began again with the Town Planning Board supporting its retention, but by early 1940, the Chinese Gardens between Coode and Mends Streets had been resumed and work was underway. Renamed McCallum Park, plans for the area included provision for sports grounds, seven acres of shrubbery, 25 tennis courts, a riverside drive and an area overlooking the park nearer Canning Highway subdivided for housing. As the population in the South Perth district increased, there were calls for dredging of the River around the jetties to enable access by larger steamers as well as access across the Narrows. Nothing further was done about the bridge at this time and although there were attempts to establish a pontoon ferry service for vehicles across the narrows from as early as 1910, it was not until the late 1920s and early 1930s that the various options for crossing the river at Perth were more seriously considered. In 1940 the South Perth Road Board called for action to deal with the increasing traffic on the old, very inadequate and increasingly dangerous Causeway, still the only crossing for vehicles between North Fremantle and Belmont. Investigations concluded that another bridge was needed as in peak periods, the Causeway was already operating with a traffic density approaching capacity and in the next 10 years the estimated growth in population south of the river would be 100,000. The building of the Narrows bridge was no longer a long range proposal, its need was seen as urgent and Cabinet approved its construction in August 1954. In late 1954 boring rigs commenced work to test the nature of the river bottom at the Narrows site and reclamation work was commenced. Surveys in 1954 found that traffic over the Causeway — the only river crossing between Perth and Fremantle — had more than doubled in five years and a design which would “harmonise with the aesthetics” of The Narrows area was approved in 1956. In March 1957, the contract to build the bridge was awarded to Danish company Christiani and Nielsen in a joint venture with local company J.O. Clough and Son. Preliminary work began on April 1. The first permanent pile was driven in August 1957. The 396.5m bridge included six lanes with footpaths on both sides. The overall structure was built as five individual spans, with the longest being 98m. Each of the sections were individually prestressed using a hydraulic jack and joined by high-tensile continuity cables. In July 1956 tenders were called in the United Kingdom and Europe and the successful tender from Christiani and Nielsen of Denmark, in association with J.O. Clough and Son of Perth was accepted in March 1957. The first of a series of permanent piles was driven through around 60 feet of mud to an average depth of 110 feet below water level in August 1957 and the project was opened on 13 November 1959, a few months’ delay caused by the nature of the site. It took more than a century of debate for officials to decide to build Perth's Narrows Bridge. It has become one of Perth’s busiest and most important river crossings, carrying nearly 200,000 vehicles every weekday. But it took more than a century of procrastination and debate before the construction of the Narrows Bridge finally began 60 years ago this month. Even then, it remained a contentious project. Some people condemned the reclamation of parts of the Swan River to support the bridge — a plan described by prominent architect Harold Boas as vandalism. And when deputy premier John Tonkin announced it would be called Golden West Bridge, it created a backwash of public protest. Ultimately, people power won. It was named after the stretch of water between Mill Point and Point Lewis which had become known as The Narrows. Debate over the need for the bridge began in 1849 when The Narrows was identified as a good bridge site. A formal proposal was developed in 1899 but the estimated cost of £13,000 was considered too great. Two years later, the Public Works Department came up with another plan for a 274m timber bridge but it came to nothing. When the Narrows Bridge was officially opened on November 13, 1959, it was the biggest precast, pre-stressed concrete bridge in the world. It had cost £1.5 million. Complementary projects — the construction of the Kwinana Freeway between the bridge and Canning Highway and the land reclamation using 3.4 million cubic metres of sand — bumped the cost up to £3.5 million. Increasing congestion on the crossing during the 1970s led to the bridge being widened to seven lanes. But by 1998, the volume of traffic using the bridge had increased again. Carrying over 155,000 vehicles every day, it had become the busiest piece of freeway in Australia. Instead of widening the bridge again, a separate road bridge was built to run parallel to the original to carry six lanes of traffic. It opened in February 2001. A third bridge was built in the 6m gap between the road bridges for trains to cross on the new Mandurah line. In 2001, a second bridge was opened to the west of the original Narrows Bridge to cope with increased traffic volumes. This bridge looks almost identical, but the construction technique was quite different. In 2007, a third bridge was opened, this one filling a small gap between the 1959 and 2001 bridges and carrying the railway line to Mandurah. THE multi-million dollar re-excavation of a historic riverfront lagoon is planned as part of a new vision for an iconic Perth beauty spot. A masterplan to develop the South Perth foreshore into a “world-class attraction” also proposes more outdoor activities, public facilities, beach art and events. A community survey found the foreshore, a popular Australia Day Skyworks vantage point, is seen as “fairly tired” and in need of “revitalisation” to “bring it back to life”. The City of South Perth, however, does not propose any residential development and only limited commercial opportunities, such as food vans. Previous attempts to develop the foreshore have met with strong opposition from residents fearful their river views could be obscured. Millers Pool, infilled when the neighbouring Narrows Bridge was built in the 1950s, will be restored to close to its original shape and reopened to the Swan River. The cost of the pool project has been cut to about $3 million as the excavation will only be four metres deep to avoid disturbing soil acids. Revised plans include a riverfront restaurant overhanging the lagoon, a pedestrian bridge and restoration of black swan habitats to encourage breeding. The redevelopment of the Old Mill precinct, which includes a flying fox to Kings Park, a museum and marina, will be considered separately. “It is across the way from Elizabeth Quay and in terms of the whole proposal, one of the components that we’re really quiet aware of is how we need to balance what Elizabeth Quay’s going to offer,” South Perth Mayor Sue Doherty said. Architect Garry Lawrence, commissioned to draw up the Millers Pool concept, said it would recognise the area’s indigenous and settlement history. Resident Peter Best, who organised a recent public forum on South Perth’s future, said as the city loses its open spaces, the foreshore will be “a green gem within a crowded space”. “Consultations have shown how very many possibilities there are for the park’s future,” he said. The development of Mends St as a piazza and promenade to capitalise on a planned $300 million, 30-storey tower near the Windsor Hotel, is the top priority. Parts of the river wall in the area have collapsed and restoration works are expected to start soon. Ultimately, a promenade stretching the entire riverfront is envisaged. Mrs Doherty said the long-term plan balanced competing demands. The following extract has been taken from page 47 of Hughes-Hallett, D. (2010) Indigenous history of the Swan and Canning rivers. 'It is believed by Lyon (in Collard et al, 1996) that the South Perth area was the country of Beeloo Nyoongars or river people. The Key Nyoongar figure at the time of colonisation was described by Lyon as Munday. Nyoongars who used this area were known as Gareen and their place was Gareenup. An important camping and fishing area was situated between the present day Richardson Park and Mill Point (Gareenup) and this area was referred to as Booryulup or the place of the Booryul or magic people. This area has since been covered by the Kwinana Freeway. The area stretched for approximately one and a half kilometres of foreshore and 150 metres into the bushland to the east of Melville Water. Today the foreshore reserve is called Milyu which is an Aboriginal but not Nyoongar word for samphire. The Como foreshore was a place for digging holes or Beenabup. Nyoongars referred to the area of rushes near Millars Pool as Goorgygoogup. The South Perth foreshore side of Perth Waters is known by Nyoongars as Gaboodjoolup or ‘the place of the shore’. Further east is Joorolup or ‘place of the jarrahs’. It is recorded (Bates, 1992) that Nyoongars would camp in the South Perth area when the beere or banksias were flowering and extract honey from the blossom. A spring which was on the Melville Water side of South Perth was widened by the Nyoongar at this time of year and blossoms were left to ferment in the water. The fermented drink was then consumed as part of this special occasion. After colonisation, one of the earliest recordings of Nyoongar presence in the area occurred when a party of thirty men from the Bidjareb (Pinjarra) Nyoongar attacked Shenton’s Mill. The leader of the party, Gcalyut, was later jailed. After about 1850, a camp near the present day Causeway was established and occasionally Nyoongars would use the South Perth area (Florey, 1995). During the 1930’s and 40’s the Parfitt and Pickett families, among others, lived here. At this time other families visited the area to catch prawns, bees, fish and crabs'. Please note: The local Aboriginal people and traditional owners of this land in the City of South Perth are often collectively known as the Noongar people. There are a number of alternative spellings in use for the word Noongar. After consultation with Aboriginal Engagement Strategy Working Group (AESWG) and others, the majority agreement was to use the spelling Noongar. This will be used by the City of South Perth in a consistent manner. The AESWG, after discussion decided that Noongar, meaning male, does not fully represent our group and community and therefore will refer to the traditional Aboriginal people of our areas as the Noongar/Bibbulmun people. Picture: Setting up Camp of the Naval Survey Expedition, at the Mill Pool, Perth, Western Australia, by Frederick Rushbrook Clause, 1828, oil on Canvas, from the Holmes á Court Collection.